On today’s walk I noticed the small red berries on this Holly. Castle Spire™ Ilex x meserveae ‘Hachfee’ is an evergreen so it stays green all winter. Small red berries appear in the late fall and into winter for added late season interest. The berries make a special treat for the birds in the winter. 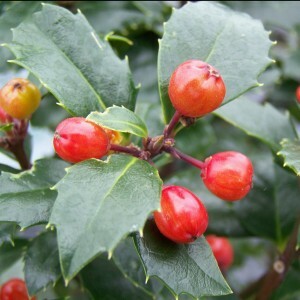 (Blue Holly) Castle Spire™ Ilex is a lovely, pyramidal blue holly with superior branching and large, lustrous, dark green leaves that change to red in the fall. The stately, narrow form makes it an excellent choice for hedges, foundation plantings, or even as a dramatic specimen. Birds will enjoy the bright red berries in the fall and winter. Castle Spire™ is a vigorous new plant that is a vast improvement over older varieties. Use Castle Wall™ Ilex as the male pollinator in a nearby planting. A Proven Winners® ColorChoice® Flowering Shrub.